1. Did you inherit a vacant property? We offer complimentary security system installations for vacant houses. 2. Did you inherited property with a lot of “stuff” that you don’t have the time, energy, or heart to sort through? We offer complimentary cleanouts with any cash sale. 3. Do you have feuding heirs or concerns with Medicare? We can refer you to local professionals and point you in the right direction. 4. Do you need to quickly dispose of real property? We offer estate sales & liquidation services. 5. Do you want to make repairs and list your property and rent it out? We offer rehab consultation and management. 6. Are you unsure of the value or equity? We offer complimentary property equity analysis and probate appraisals. Not sure if you should list or sell for cash? 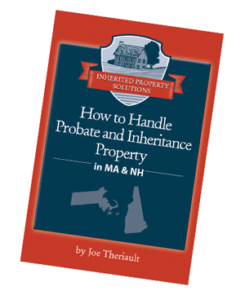 Download a free guide to help you determine which path to take in selling your probate or inheritance property.